Butter a jelly roll pan. Line with parchment paper; butter parchment, dust lightly with flour and shake off excess. Sift together cake flour, all-purpose flour, baking powder and salt. In a separate bowl, combine unsweetened coconut milk and vanilla; whisk to blend, add coconut and stir to blend. In a bowl of a stand mixer fitted with a paddle attachment, beat Plugrá Butter and 1½ cups sugar for 3 minutes, or until light and fluffy. Add eggs, one at a time, and mix until incorporated; transfer batter to a large bowl. Alternately add flour mixture and coconut mixture to batter in 3 batches, until blended. In the bowl of a stand mixer fitted with a wire whip, beat egg whites with cream of tartar and 1½ cups sugar to form medium stiff peaks; add to batter, stirring slowly with a balloon whisk until incorporated. Reserve 3/4 of the batter. To the remaining 1/4 of batter, stir in dutch cocoa powder. Set aside. Spread white batter evenly in the jelly roll pan. Dollop with the dutch cocoa batter and using a butter knife, swirl into the white batter to gently combine and marble; tap pan on counter to eliminate air bubbles. Bake for 20-22 minutes, or until a toothpick inserted in center comes out clean; cool on cooling racks for 5 minutes. Run a knife around outer edges of pan and cut into four equal rectangular pieces. Transfer cake pieces onto a wire rack to cool. Combine unsweetened coconut milk, cream of coconut, coconut rum and simple syrup and whisk to blend. Reserve. In bowl of stand mixer filled with a wire whip, combine heavy cream, cream of coconut, confectioner’s sugar, shredded coconut and vanilla extract. Place the chocolate chips into a heat proof bowl. Heat the heavy cream in a microwaveable container (I used a glass measuring cup) and microwave for 3-4 minutes on high or until it just begins to simmer. Do not let the cream boil over. Pour the cream over the chocolate chips and let it stand for 2 minutes. Whisk until chocolate is smooth and let it come to room temperature by letting it sit for 30 minutes or chilling in the fridge for 5-10 minutes. Whisk again just before assembling the cake. Arrange 1 cake layer on a cake stand or large plate. 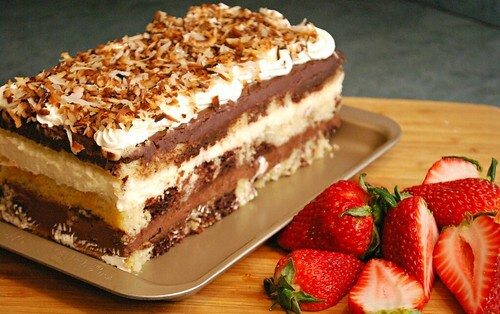 Brush the top of cake generously with reserved coconut simple syrup. Using an offset spatula, spread evenly with coconut cake filling and chocolate ganache, alternating as you please. Repeat with 2nd and 3rd cake layer. Place remaining coconut cake filling into a piping bag and pipe on top of the cake. 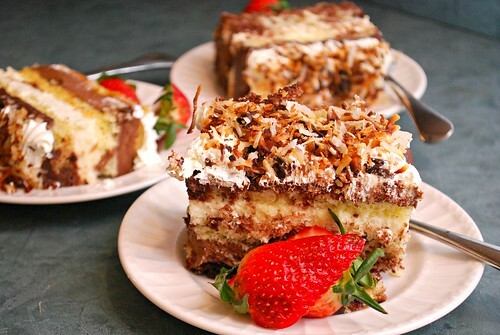 Garnish the top of the cake with toasted coconut and chill cake for 3 hours before serving.